Should Allergan Investors Stick With Actavis? Just because you own Allergan doesn't mean you should necessarily own Actavis. Investors fortunate enough to own Allergan (UNKNOWN:AGN.DL) have been handsomely rewarded this year. Thanks to Actavis' (NYSE:AGN) $66 billion bid to buy its fellow drugmaker, Allergan's shares have jumped 92% in 2014. Actavis has agreed to pay Allergan shareholders $129.22 in cash and 0.3683 of an Actavis share for each Allergan share owned. This deal is expected to close in the first half of 2015, and it rightly raises some serious questions for Allergan shareholders. Given that Allergan will become part of the much larger Actavis, investors might not question if they should sell their shares or roll the dice and stay long. Investors should make their stock decisions based on a solid understanding of a company's business and opportunity, rather than on price returns. That means investors should not expect that Allergan's performance this year will translate into similar returns for Actavis in the future. Instead, Allergan investors should create a new investment thesis based on Actavis' particular business model. Since that business model differs from Allergan's, let's take a closer look. 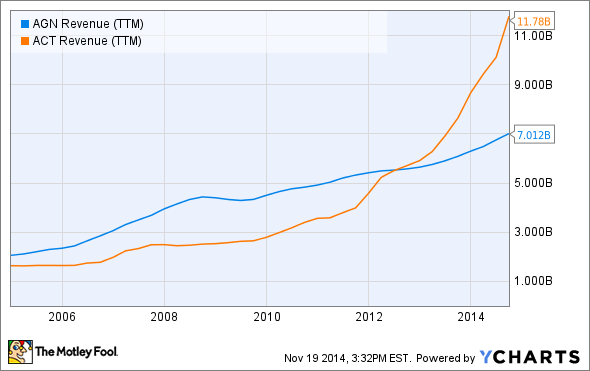 Both Allergan and Actavis have grown dramatically over the past decade. Allergan has seen its trailing 12 month sales climb from $2.5 billion in 2006 to more than $7 billion this year, while Actavis' sales have jumped from $5 billion in 2012 to nearly $12 billion this year. Although both companies have enjoyed enormous top-line growth, they have gone about it differently. Allergan's growth has come predominately from rising use of its top-selling Botox, a therapy that is used both for cosmetic and therapeutic treatments, and from sales growth for its ophthalmology products, which account for nearly half the company's sales. Alternatively, a significant amount of Actavis' revenue growth has come from mergers and acquisitions. Actavis' string of purchases has made it one of the biggest generic-drug makers on the planet and a major player in brand-name treatments addressing a host of disorders. Those acquisitions include the purchases of Warner Chilcott for $8.5 billion in 2013 and Forest Laboratories for $25 billion earlier this year. AGN Revenue (TTM) data by YCharts. Since the two companies have taken different paths to growth, Allergan investors preferring growth-from-within, rather than growth through M&A, may be questioning whether or not to stick with Actavis. Let's take a look at some financial ratios and see what additional insight we can gain. First up is the current ratio, which measures a company's liquidity by taking its current assets (cash, cash equivalents, receivables, inventory) and dividing them by short-term liabilities (notes payable, current debt payments, payables, accrued expenses, taxes). It's a quick way to help investors see whether a company is likely to make good on its short-term obligations if debtors come knocking. Generally speaking, a higher number is better for investors. In this regard, Allergan's current ratio of 4.27 is far more enviable than Actavis' 1.34. Although Actavis' ratio is fine, it is more than three times lower than Allergan's, which could give the latter company's shareholders a reason to pause. Next up are the two companies' operating margin and free cash flow. Actavis' acquisitions have brought its operating margin to a negative 5.99% over the past 12 months. That's a far cry from the 26.2% operating margin notched by Allergan during the same period. However, a negative operating margin due to acquisitions isn't necessarily a bad thing, especially if the purchased companies deliver profit growth down the line. Meanwhile, Actavis' free cash flow totals $1.72 billion, up impressively from just $375 million in 2012. 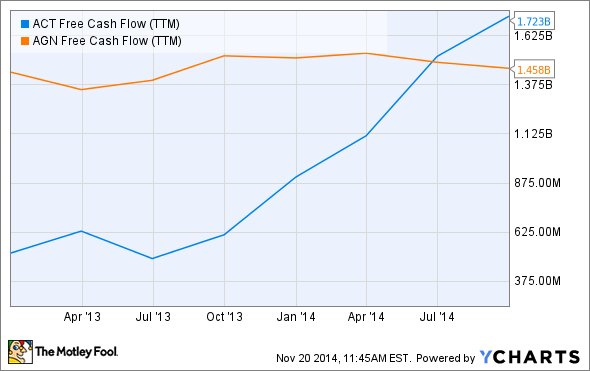 That free cash flow growth stacks up favorably to Allergan, which has seen its free cash flow stagnate. In my view, Actavis' free cash flow growth suggests it has done a good job (so far) of integrating previous deals and delivering on projected cost savings. ACT Free Cash Flow (TTM) data by YCharts. The price-to-earnings, or P/E, ratio is the gold standard for valuing companies. The P/E ratio shows investors how much they are paying for every dollar of earnings generated by a company. However, valuing M&A-oriented companies such as Actavis using a P/E ratio based on historical results that are weighed down by acquisitions can be misleading. Because of that, it might be more useful to look at analysts' forward earnings projections instead. Granted, these projections are estimates and thus often incorrect, but they can help form a better picture of what investors can expect in the future. Ideally, investors prefer to pay the least amount possible for earnings, especially when they're growing. Under that assumption, Actavis' forward P/E of 16 isn't cheap, but it isn't sky-high, either. Additionally, Actavis' forward P/E is a bit more reasonable than Allergan's forward P/E of 24.7. Actavis is also a more value-type stock than Allergan when it comes to the price-to-sales, or P/S, ratio. The P/S ratio tells investors how much they're paying for every dollar of a company's revenue. Investors are paying about six times sales to own Actavis, but they'd pay nine times sales to own Allergan. The difference in valuation between the two companies suggests they might be best suited for two different types of investors. Typically, value investors embrace companies with lower P/E and P/S ratios than do growth investors. However, since analysts think Actavis' earnings per share will grow 22% next year, it's probably more fair to suggest that growth at a reasonable price, or GARP, investors would be most intrigued by this company. Conversely, growth investors would most likely have been fans of Allergan, particularly given that the company's earnings were expected to grow 36% next year. Possibly one of the best ways to show the contrast between these two companies is by considering how Actavis' cost-cutting ways differ from Allergan's commitment to growth through research and development. Even though Allergan is smaller that Actavis, it spent about $300 million more on R&D over the past year. That suggests Actavis is more interested in delivering operational growth than it is on discovering the next billion-dollar blockbuster. Based on its past acquisitions, I have little doubt Actavis will deliver on its promise for double-digit earnings accretion once the Allergan deal closes. However, a lot of that accretion will come from executing on Allergan's previously announced plan to reduce expenses by $475 million per year and Actavis' own $1.8 billion cost reduction plan, rather than from investments in organic growth. Given the distinctions between these two companies, Actavis might be better suited to GARP-style investors, while Allergan's more growth-oriented investors might want to look elsewhere.